Some roof top recreational vehicle air conditioners, for example Colman brand RV airconditioners have a heating element or 'heat strip' installed which is intended to be used as a supplement to the RV furnace. If you don't have one installed it's likey an option. The heating element is the equivalent in capacity to a small portable electric heater... about 1500 watts. It's generally used on to take the chill off the air rather the heat the RV. But you can use it when your furnace isn't working to get you through a cold night. You may not be toasty warm but you wont freeze either. If you don't have one should you get one? Depends of course. 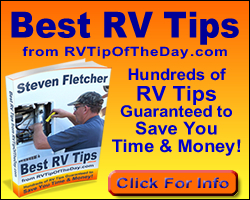 Some RVers believe it is a good thing to have an air conditioner heating element and it is worth the money. Others, of course, don't. The difference of opinion, I believe, comes as a result of a perception. The fan in an RV air conditioner moves a lot of air and a small 1500 watt heating element just doesn't have the capacity to heat all that air to the point that it feels hot. That leads many people to think that it is not working properly or at least not well enough to to be of value. These folks argue in favor of the portable heater... they can feel the heat from it! But 1500 watts is 1500 watts. You can feel the heat from a portable heater because it doesn't move the air as fast so it has more time to get hot. The advantages of the heat strip in the RV airconditioner are that it will probably be more reliable and it doesn't take up any more space in the RV. The disadvantage is the noise... listening to the AC fan for a long period of time gets tiresome... to me anyway. The advantage to the portable heater is that it is portable. On a really cold night when your furnace isn't working you could close off the rest of the RV and keep your bedroom fairly warm. And it's a lot quieter than the AC. Disadvantages are unreliability... I've replaced several over the years. It takes up space using it and storing it. Although small, there is a risk if accidental fire or electrocution. Maybe it's a good idea to have both?